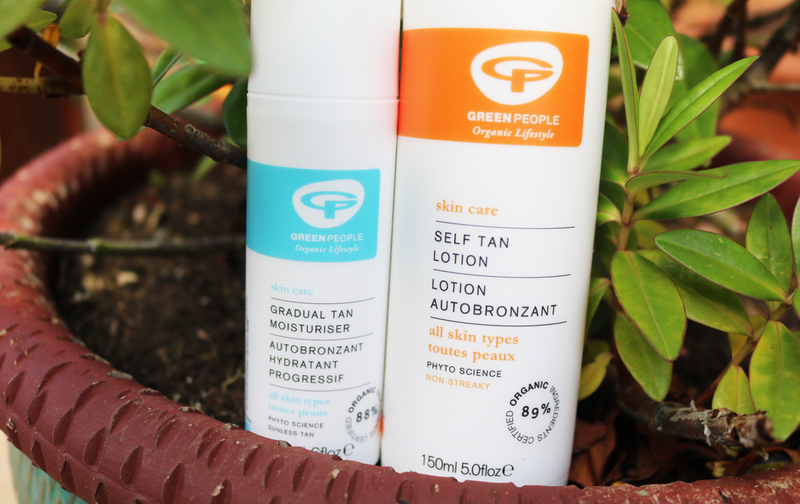 Whether you've recently come back from a late Summer holiday and want to keep your tan going for longer, or you simply want to fake a healthy glow in the comfort of your own home, these two natural beauty gems from Green People are available to give you a cheeky helping hand! Regular readers will know that I'm a huge fan of slapping on the fake tan, and this year in particular, I've been really enjoying testing out some amazing self-tanners and gradual tan products from various natural and organic brands. It's great to see more green beauty companies bringing out self-tanning ranges and giving consumers the option to try out these products which have much 'cleaner' formulas and more organic ingredients than their mainstream counterparts. But are they any good? I've come across a couple of hits and misses, but thankfully these two from Green People have managed to meet my high expectations! If you're new to self-tanning, are worried about going too dark or just want a light subtle glow, a gradual tan moisturiser is a great place to start. This vegan-friendly gradual tan moisturiser from Green People is made with 88.4% certified organic ingredients and contains low levels of naturally derived DHA that allows you to slowly build up a light tan over 4-5 days. It also contains lots of skin nourishing ingredients such as Rosehip Seed Oil, Green Tea and Prebiotics, so it's gentle on the skin, feels moisturising and is suitable for all skin types to use, including sensitive and eczema prone (but of course, always do a patch test first if you're trying any new product for the first time). I really like how it feels light and doesn't feel sticky or greasy afterwards, plus it smells quite nice with a fresh citrusy scent. I've tried this on my face too with good results, so it's one to try if you've been struggling to find a natural facial self-tanner. My only criticism about this product is that you don't get a lot of it as the tube is only 50ml, which means you'll go through it fairly quickly if you're using it on a regular basis - it would be great to see GP launch a bigger bottle at some point in the future! 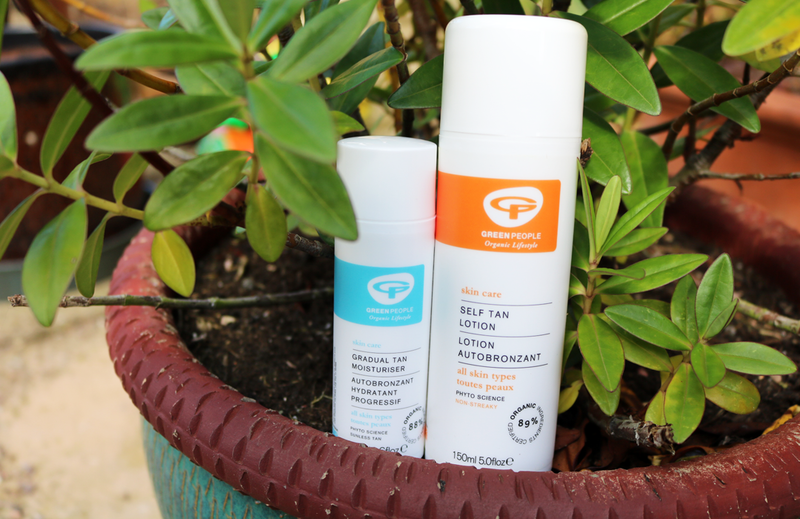 For more colour and a faster result, Green People's Self Tan Lotion develops into a lovely light and natural looking tan in just 2-3 hours using the same sugar-derived DHA, but at higher levels than the Gradual Tan. It's buildable too, so if you want a darker tan, you can just apply a second or third coat for a more bronzed finish. Applying this Self Tan Lotion is similar to mainstream tans that have a lotion consistency; make sure you exfoliate thoroughly beforehand and using a tanning mitt makes it easier to buff into the skin, ensuring a streak-free result every time. It has a little bit of a fake tan smell, but this is mostly masked by the essential oils in the formula and I think it smells much nicer than most tans I've tried! Being a natural product (made with 89.7% certified organic ingredients) means that this tan won't last as long as mainstream ones simply because it doesn't contain the extra chemicals that those tans have. However, I managed to get around 2-3 days out of it before I started to notice it fading. So if you're after an easy to apply, mostly organic, natural self-tanner that's free from parabens, SLS/SLES, alcohol (ethyl alcohol, ethanol), lanolin, methylisothiazolinone, methylchloroisothiazolinone, phthalates, artificial perfumes, PEGs, DEA, petrochemicals and colourants, this is definitely one to try. Have you tried any natural self-tanners?